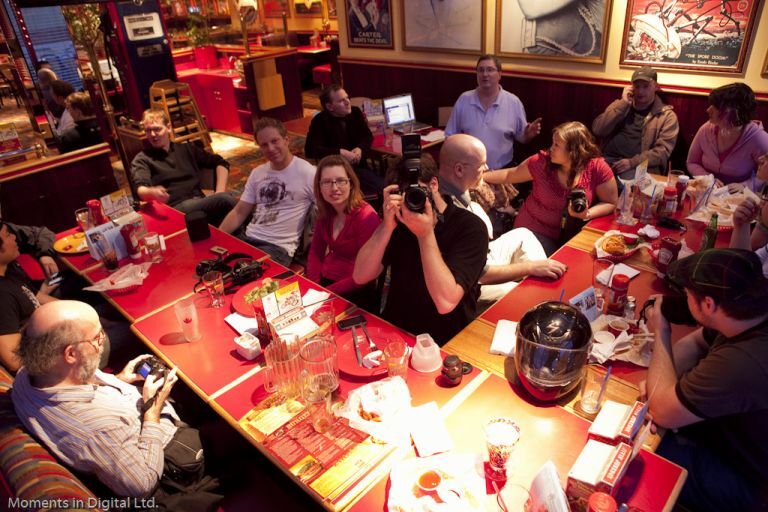 Last night I attended the first Edmonton Photography Tweetup at the Reb Robin downtown location. For those who are unfamiliar with the concept of a ‘Tweetup’ it is basically an in-person meetup consisting of people who are using the mico-blogging service Twitter. There have been several successful Tweetups in Edmonton already including a fund raising event called Twestival which raised money for Charity Water. During one of these Tweetups I met Tony Ratcliffe who expressed an interest in organzing a meeting of local Twitter users who shared an interest in photography. The basic idea behind the meetup is to talk about photography, share techniques, offer advice, and possibly provide some basic photography instruction. There are additional photos on my Flickr feed. Mack Male also has a recap up on his site and Bill Burris has posted some photos to his Flickr feed. Our next meetup will be a Photowalk on May 12th, at 6:30pm at Ezio Farone Park (around 109 St on the north-west side of the high-level bridge). The topic/assignment will be selected soon so keep your eye on the Wiki for details or if you are using Twitter you can head over to www.search.twitter.com and search for the hashtag #yegphoto. Everyone is invited to come out with their cameras to shoot for about an hour or so and then we can head to a local watering hole to debrief, share images, and chat about techniques, etc.